There are lots of different types of equipment that rely on hydraulic hose assemblies. In some situations, the only way to safely change out the hoses and keep the machine running smoothly is to use custom hydraulic hose services. Our Greater Fall River industrial supply company can help you get the custom sizes, arrangements, and accessories you need to provide safe and effective hydraulic system operation. We are proud to serve customers who work across many different industries in the Southeastern Massachusetts area. We have provided quality custom hydraulic hose in Fall River, New Bedford, and the local region to customers who work in the automotive, agriculture, and manufacturing industries. Our team also services customers from the marine, medical system, metal production and processing, power generation, and railway industries. Other customers work in robotics, textile machinery, recreational equipment, printing machines, power tools, and construction equipment. Warehouse equipment, food processing and packaging facilities, industrial gears and machine tools also rely on hydraulic hose assemblies to operate. Our services are also available to customers outside the Southcoast region. We ship products to customers all across the country and around the globe. We stock domestic and foreign sizes to ensure that we are able to provide custom hydraulic hose services designed to meet absolutely every need and requirements. We have capabilities for our custom hoses that are unmatched by any other local supplier. Our technicians can offer 2″ 1-6 wire hydraulic hoses, depending on the needs of our customers. We go above and beyond to meet or exceed the expectations of our customers, providing same-day services on most of our custom hoses. 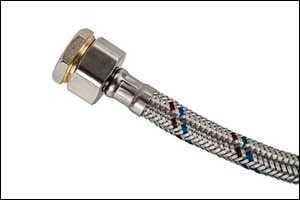 We can even offer hoses made “while you wait” ranging from 1/4 ” ID to 2″ ID, four spiral, ultra-high pressure and low pressure, crimp fittings, US and metric ends, as well as steel, brass, and stainless steel options. We can also provide hose for air, water, and oil suction, as well as discharge hose. Ask about our wide selection of adapters and couplings. Industrial grade hydraulic hoses are made in layers. The exterior is typically an abrasive-resistant material, and the interior is most often made from rubber. Depending on the industry and the way that the hoses will be used, various grades of rubber, thermoplastic, Teflon, woven wire, high-performance textiles, and steel can be used to add strength, flexibility, or provide protection for high pressure or extreme fluids. Some materials allow the hoses to be more flexible, cost-effective, or light in weight. Others help increase resistance to heat, environmental challenges, and vibrations when equipment is operational. There are so many different variables, sizes of hoses, clamps, couplings, and other elements that go into hydraulic hose assemblies that custom is sometimes the only way to go. Hydraulic hoses break down under the strain of high temperatures, twisting, stretching, and normal wear and tear. It is essential to pay attention to hoses and inspect them on a regular basis to prevent failure. You may require custom hydraulic hose services if you notice the hoses on your equipment begin to crack, swell, bubble or blister. Changes in pressure that create inconsistencies can also be a sign of imminent failure. If you note any of these symptoms, stop by our Greater Fall River industrial supply or contact our technicians to see about ordering custom hydraulic hose assemblies. We can design and create custom-fabricated replacement hoses in a wide range of grades, sizes, lengths, and types, depending on your specifications. Not sure what you need? Bring in your existing hose or measure the broken hose to contact us about getting custom hydraulic hose in Fall River. Our sales team has over 80 years of combined customer service experience working with industrial supply and hydraulic hoses. We can answer your questions about any of the services that we provide or offer a FREE estimate for custom hydraulic hose services in Fall River, New Bedford and the surrounding area. Call today at 508-996-8400 or stop by our location on Coggeshall Street in New Bedford, MA.